According to NEJM, Telehealth is defined as the delivery and facilitation of health and health-related services including medical care, provider and patient education, health information services, and self-care via telecommunications and digital communication technologies. Some types of telemedicine are store-and-forward telemedicine (asynchronous telemedicine), remote patient monitoring, and real-time telemedicine. 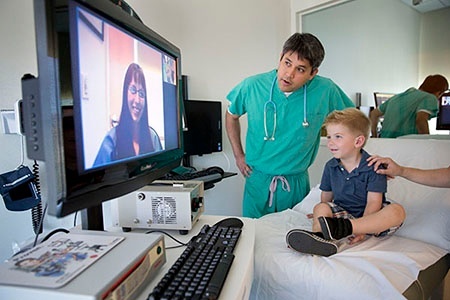 A Rutgers article mentioned around half of the country’s hospitals use some sort of telehealth solution and recent surveys of health care executives discovered 90 percent of respondents had started the process of implementing telehealth programs at their organizations. Since Telehealth is growing rapidly here are some pros and cons to keep in mind. Telemedicine improves patient's access to healthcare services. They don't have to miss work, find transportation or travel far to their nearest providers. It allows Nurses and Doctors to expand their reach to patients in distant locations or rural areas. The convenience of quick real-time consultations for non-emergency symptoms, frees up office appointments so healthcare professionals can spend more time with extreme case patients. According to americantelemed.org, reducing or containing the cost of healthcare is one of the most important reasons for funding and adopting telehealth technologies. Telemedicine has been shown to reduce the cost of healthcare and increase efficiency through better management of chronic diseases, shared health professional staffing, reduced travel times, and fewer or shorter hospital stays. Patients must have access to appropriate technology like a laptop or computer with video conferencing capability and internet or wifi. Some patients may not be tech-savvy and will need assistance with setting up. Also there are sometimes glitches. Technical difficulties, such as sound or video not working properly, can disrupt a telehealth visit. There are some security concerns since the visit is done over the computer. Regulatory attorney, Emily Wein said, "Your computer, your ipad, your iphone, or whatever interface or kiosk you have at your employer - these are all potential devices that could store or transmit your personal health information." A telehealth patient's health information is being transmitted for "various modalities," increasing the potential that data might be misused, mistransmitted or accessed inappropriately, she says. 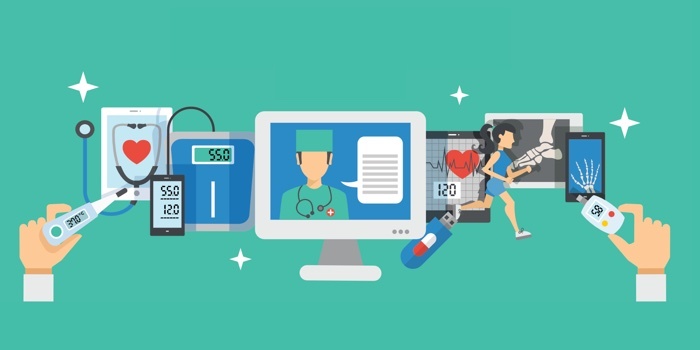 According to an article by Health Informatics, a big challenge for telehealth is reimbursement and coverage for services compared to those of in-person services. There is no guarantee of payment parity between telemedicine and in-person health care. Even in the 28 states in which payment parity laws have been passed, no apparatus exists to enforce it. This could potentially defeat the point of telemedicine to reduce health care costs and expand access to services , and could also discourage providers from offering telehealth because there is no guarantee of comparable payment. Are you using telehealth services at your job? What are some advantages or disadvantages you've experienced? Comment below! Over the past 60 years, both private and government third-party payment policies have shaped our health care system. Medicare hospital inpatient payment policies during the mid-1980s set a precedent for most payers to change cost-based to prospective payment systems and resulted in hundreds of hospitals closing or merging. Until 1990, private and public third party payers had no explicit policy to pay for telehealth or telemedicine services. Medicare reimbursed services that did not require face-to-face contact between a patient and practitioner, such as radiology or EKG/ EEG. Reimbursement was idiosyncratic depending on policies of Medicare. The Balanced Budget Act of 1997 (BBA) signaled a change in Medicare payment policies that opened the door for telemedicine reimbursement. This article will describe current Medicare telemedicine policies and discuss how the growth of telemedicine affects our current and future career Nurses. Under the BBA, only services provided to patients in federally-designated rural Health Professional Shortage Areas were eligible. These generally lack primary providers. For example, a community may have a Nurse or GP, but no specialists such as cardiologists, psychologists or even dermatologists. These communities greatly benefit from telemedicine, but the telemedicine providers who served them could not be reimbursed under the BBA. From this conundrum came the telecommunication consult, fee splitting and general chaos regarding defining the services a patient received, and from whom, and how it was to be compensated. The command to follow the money was not only difficult, but so was finding the money in the first place. The awesome superiority was clear in many instances where personal contact by physicians was not necessary but exchanged technology was vital. There was a flurry in the field of home health care Nursing, which suffered horrendous setbacks in funding during the 90s and the services that survived were cut back in quantity. Technology changes all businesses and how we conduct them. No better can this be seen than in the growth of the Internet. Developments in bio-informatics, miniaturization, and computer chip design promise major advances in prevention and treatment of disease, including providing health education and counseling in patients’ homes. This new world of health care is not universally available in the USA. The telecommunications for telemedicine are still inadequate or unaffordable in many rural areas. So why should Nurses be concerned? Nurses have much to gain. 1. Telehome care is a Nursing industry. 2. Nurses play a key role in all telemedicine, usually managing. 4. Nurses often are the key providers of preventive services, many of which would be enhanced by access to telemedicine services. Given the concerns of third party payers as to whether to pay, the voice of Nurses must be heard. The question for Nurses is: Will we be at the table when decisions setting telehealth payment policies are adopted? The future Nurses’ role must be acknowledged and categorized efficiently as new telemedicine legislation is entered in states like AK and CA. Emphasis must be equal for preventative as well as curative medicine. Nurses usually have the management and technological administration of both preventative care duties and the tech equipment and shared information with other professionals. This acknowledgement should result in a categorizing of new Nursing skills relative to the technological needs of medicine. As technology in medicine grows, so should the field of RN’s as it embraces additional functions and departments. Follow the Money to Nursing? Incredibly, it could be that the future decade will promote the values of the requirements of RN’s to the point that the skills receive increased compensation on a level with their increased duties. Payment of their skills by Medicare and other third party insurers will open a floodgate of better and more efficient medical care for patients and in time will increase the health care of our nation. The USA is considerably behind other countries in this regard despite having the resources and expertise in medical specialization. The senior population is more likely to need Nursing care, yet the population of qualified Nurses in diminishing. There is increased opportunity for young men and women to enter the Nursing profession as an upwardly mobile career. Interested in reading more blogs? Sign up for our bi-weekly mailing list below. According to the Centers for Disease Control and Prevention, every year about 800,000 Americans experience a stroke and 130,000 of those cases are fatal, which makes strokes one of the leading causes of death in America. For patients, the most critical time for treatment is within three to fours hours immediately following a stroke. For those living in Arizona's rural communities, getting that immediate treatment can be challenging. Dr. Bart Demaerschalk at the Mayo Hospital in Phoenix has found a way to get around that challenge. He and some co-workers have a developed a program called Telestroke. Telestroke is a telemedicine audio and visual device system. It's best described as a "robotic" doctor for stroke patients. The robot allows a doctor hundreds of miles away to assess and treat a patient. The doctor remotely controls the robot and follows patients through rural community emergency rooms. He can even view a patient's vital signs or take and look at X-rays and CT scans. After all that, the doctor can recommend treatment options for the patient. Right now, there are 12 Telestroke robots throughout Arizona towns. It is Demaerschalk's hope to eventually have other telemedicine programs available for other emergencies that may arise in rural communities. For more information about the Telestroke program at the Mayo Hospital, visit www.mayoclinic.org/stroke-telemedicine. NANTUCKET, Mass. — When Sarah Cohen’s acne drove her to visit a dermatologist in July, that’s what she figured she’d be doing — visiting a dermatologist. But at the hospital on Nantucket, where her family spends summers, Ms. Cohen, 19, was perplexed. In this special issue of Science Times, we look at some of the many ways that technology is changing the world of medicine. Suddenly, two doctors appeared on the video screen: dermatologists in Boston. A nurse in the room with Ms. Cohen held a magnifying camera to her face, and suggested she close her eyes. That, she realized, was the point. Technology, like these cameras and screens, is making it affordable and effective for doctors to examine patients without actually being there. More hospitals and medical practices are adopting these techniques, finding they save money and for some patients work as well as flesh-and-blood visits. On Nantucket, an island 30 miles from the nearest spit of mainland, “telemedicine just makes a lot of sense,” said Dr. Margot Hartmann, chief executive officer of Nantucket Cottage Hospital. “It allows us to meet the mission of the hospital better because we’re offering more locally,” and saves patients the cost and time of flying or ferrying off-island, then driving to Cape Cod or Boston hospitals. The island may be small, but it has strikingly diverse medical needs. Its year-round population of about 10,000 balloons to 50,000 in the summer. And while it is famous for wealthy visitors, its year-rounders are much less affluent. They include immigrants from many countries, and range from businesspeople to scallopers. Nantucket has all the ailments one would find anywhere, plus some exacerbated by island life: skin cancer, tick diseases, water accidents. Nantucket’s hospital has a handful of year-round doctors. While mainland specialists do visit, fog or storms can keep them from getting there. And specialists cost money. The hospital, millions in the red in recent years and now needing $60 million to replace its outmoded 1957 building, must pay for the specialists’ travel and lodging. Telemedicine, done by doctors at Massachusetts General Hospital, saves some of those costs, and generates revenue because it means more tests are done on Nantucket. “If someone was going off-island to see a dermatologist, they would probably have their labs and X-rays done where that dermatologist was,” Dr. Hartmann said. Instead, tele-dermatology saves nearly $29,000 a year because two dermatologists now visit only four times a year, but appear on screen six times a month and see 1,100 patients a year. Previously, dermatologists visited monthly, and always had “100 people on the waiting list,” Ms. Bushong said. Nantucket also uses tele-radiology, having Boston radiologists, some specializing in certain body areas, read X-rays and scans. It has used tele-pediatrics twice, for a child in a car accident and one in diabetic crisis. Tele-stroke uses video neurologists to quickly determine if a patient’s stroke type warrants a clot-busting drug, tPA, or if tPA could harm the patient. Tele-endocrinology, for thyroid problems and diabetes, is starting. And Nantucket hopes to have video sessions for autistic children “so parents would not have to take kids with autism off-island, since it’s hard to travel with them and it upsets them,” Ms. Bushong said. Dr. Hartmann envisions tele-rheumatology and tele-psychiatry, among other teles. Instead of screens in one exam room and the emergency room, “I would love to see every room telemedicine-capable,” she said. But there are limitations, nationally and on Nantucket. Dr. Yellowlees said interstate telemedicine was hindered by rules requiring that doctors be licensed in the state where patients are treated. Insurance coverage varies, with Medicare and some policies covering telemedicine services only in rural areas. “If you’re in a city, Medicare will only reimburse if you’re in the same room as the doctor,” Dr. Yellowlees said. And some telemedicine is not cost-saving or accepted by doctors on the receiving end. Memorial Hermann Hospital-Texas Medical Center in Houston ended a tele-I.C.U. program in which intensive care specialists monitored and assisted intensive care units at five other hospitals. It was expensive and not demonstrably better, and some doctors and nurses disliked being watched from afar, said Dr. Eric J. Thomas, associate dean for health care quality at University of Texas Medical School at Houston. On Nantucket, Dr. Timothy J. Lepore, 67, a surgeon and the hospital’s medical director, sees value in some long-distance doctoring, but has some concerns. He especially prefers having a radiologist on-site because he believes that conferring in person helps prevent mistaken readings and gets quicker results. Dr. Lepore said that one tele-radiologist misread a chest X-ray, missing that the patient had pulmonary edema, fluid in the lungs. And when Dr. Lepore injured a hamstring while running, a tele-radiologist said an M.R.I. showed Dr. Lepore had pulmonary edema of the hip, which was bizarre and impossible. His actual diagnosis: a torn hamstring. Dr. Efren Flores, a radiologist who divides time between Boston and Nantucket, said he has learned to heed Dr. Lepore’s insistence on fast, accurate tele-radiology readings because on Nantucket it is important to determine if patients can be treated there or must be flown to Boston. Many patients appreciate that telemedicine saves them trips off-island, but not everyone likes it. So, in August Dr. Schalock remotely diagnosed eczema in Aaron Balazs, 35, but saw him in person in September and increased his medication dosage and switched him from a cream to pills. By the time Ms. Cohen had her second session in August, this time with Dr. Schalock, she said, “I feel like it’s the same thing” as an in-person visit. She had accepted the mega-magnifying camera by then.